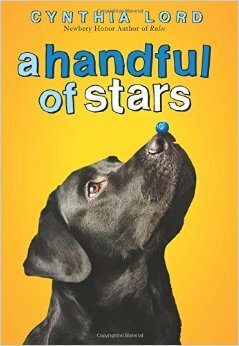 A Handful of Stars by Cynthia Lord. Scholastic Press, New York, NY, 2015. When Lucky, Lily’s blind dog, races across a blueberry barren, a young girl catches him by offering him her peanut butter sandwich. When Lily meets Salma Santiago, a migrant worker, Lily feels guilty, thinking that sandwich could’ve been the only thing Salma had to eat for lunch. But when she tells her grandma, Grandma decides Lily should take Salma a tourtiere, a traditional French Canadian meat pie. “You want me to bring her a pork pie?…Maybe she’s a vegetarian…I should bring her bread and peanut butter so she can make a new sandwich.” Lily tries everything to avoid going to the migrant camp. It would be embarrassing walking in there with a pork pie. But Grandma wouldn’t hear of it. With the help of her grandfather and the camp manager, Lily finds Salma and drops off the pie. The little blue houses the migrants live in seemed so cute until Lily realizes they are just four walls with very little room inside. And there is no stove to bake the pie. But Lucky has brought the two girls together in an unlikely friendship that will open Lily’s eyes to a whole new world. Lily is painting small bee houses that people in Maine put in their gardens. She sells them at her grandparent’s general store, saving up the money for an operation for Lucky so that he can see again. Lily uses stencils when she paints. When Salma offers to help, Lily discovers that Salma is an artist and she is not afraid to experiment. Salma does not use stencils. She paints the houses in wild vibrant colors and Lily thinks no one will buy them, but Salma’s colorful bee houses fly off the shelf. Salma encourages Lily to put the stencils away and paint free hand, but Lily isn’t brave enough—she’s afraid she’ll ruin the bee houses and she needs every penny for Lucky’s surgery. Lily, who lives with her grandparents, has never known her own parents. Salma travels back and forth across the country with her parents always moving, never staying long in any one place. Both girls are dealing with loss and through the course of the story each of them will learn from the other. This is a gem of a book. I defy any dog lover not to cry at several points in the story—not because Lucky dies, he does not—but because the prose is so well written and the story so poignant the reader will be feeling the same emotions Lily and Salma feel. Lord’s writing is clear and evocative; the voices of her characters realistic. The two cultures of the girls—Hispanic and French Canadian—are handled with authenticity and care. An extra perk for this reader was to learn so much about Maine and the blueberry harvest. A Handful of Stars is a quiet book. There are no explosions, no huge dramatic moments; only a story about two twelve-year-old girls struggling with loss and trying to figure out who they are.